My mother just sent me an adorable picture of her two dogs "pretending" to be twins. 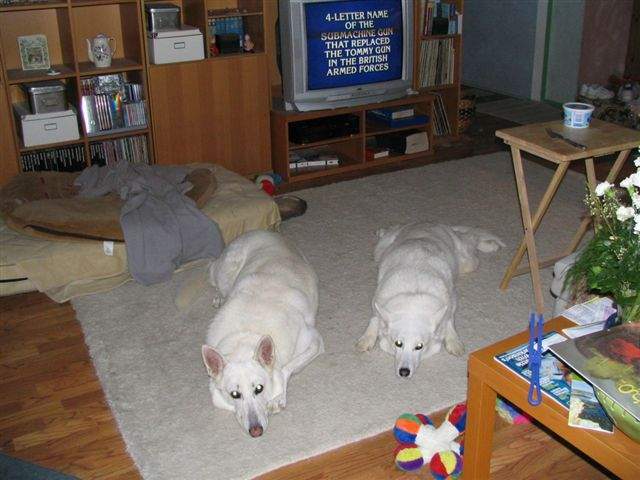 Apparently, they were watching Jeopardy when the dogs did this. The photograph was actually taken to show off Nanama's new bed, which is in front of the bookshelf. Lucky Tuesday (a.k.a. "The boy Dog", "the Duckman", or "the Loveaduck") is nearest the bed, and Nanama (a.k.a. "The Girl Dog", "Kitten Cat") furthest from it. Okay, I just went into cute-coma here. Ah, they are so sweet! They remind me of my grandparents' old dog, Amos. He was sweet, too. I remember Amos. He used to "sing" with your grandfather, didn't he?